The team of Hasan Shihab Uddin, Sujoy Kumar Chowdhury, Nahid Mahfuza Alam (Shapla), and Md Mahbubur Rahman - Level 4 Term 1 Students of Department of Computer Science and Engineering, has successfully represented BUET in the Sixth SoftFair 2005 organized by North South University Computer Club (NSUCC) from August 4 - 6 at the Exhibition Centre of Bashundhara City. 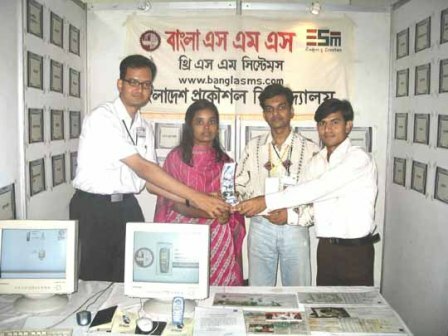 Their Bangla SMS software secured first position among the university participants. A high number of private and public universities along with the renowned IT companies participated in this year's fair. Their Bangla SMS software attracted huge crowd at the BUET stall. It is to mention that theirs was the only software at the University level that had already been and also is currently deployed at the industry. Their stall was also decorated uniquely with innumerable snapshots of Bangla Text messages generated by their software.